Several languages are spoken in Sri Lanka within the Indo-Aryan, Dravidian and Austronesian families. 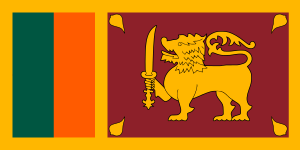 Sri Lanka accords official status to Sinhalese and Tamil. The languages spoken on the island nation are deeply influenced by the languages of neighbouring India, the Maldives and Malaysia. Arab settlers and the colonial powers of Portugal, the Netherlands and Britain have also influenced the development of modern languages in Sri Lanka. The Sinhala language is spoken by the Sinhalese people, who constitute approximately 75% of the national population and total about 13 million. It uses the Sinhala abugida script, which is derived from the ancient Brahmi script. 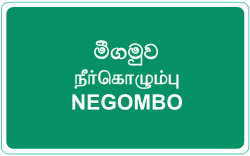 The Rodiya language, a dialect of Sinhala, is spoken by the low-caste community of chamodi veddhas. The Veddah people, totaling barely 2,500 in 2002, are thought to have once spoken a distinct language, possibly a creolized form of an earlier indigenous language. The Tamil language is spoken by Sri Lankan Tamils, as well as by Tamil migrants from the neighboring Indian state of Tamil Nadu and by most Sri Lankan Moors. Tamil speakers number around 4.7 million. There are more than 50,000 speakers of the Sri Lankan Creole Malay language, which is strongly influenced by the Malay language. There are also a large Maldivian population and they speak Dhivehi as their primary language. English in Sri Lanka is fluently spoken by approximately 10% of the population, and widely used for official and commercial purposes. It is the native language of approximately 74,000 people, mainly in urban areas. A handful of the 3,400 people of Portuguese descent speak Sri Lankan Portuguese creole. The Muslim community in Sri Lanka widely uses Arabic for religious purposes. Seldom used nowadays is Arwi, a written register of Tamil that uses the Arabic script and has extensive lexical influences from Arabic. ↑ "Sri Lanka - language". Retrieved 20 June 2014.